Are you aware of a tool or a service that can provide reliable search volume history for certain keywords? Like how many searches there were for "keyword phrase" in each month of 2005. Keyword Intelligence and Keyword Discovery (in depth review of many keyword research tools) both offer seasonal data to some extent, but both are limited in their database depth. Search traffic falls off sharply when you leave Google and Yahoo!. Unless you are Google or Yahoo! it is just plain tough to gather exceptionally useful and meaningful data (unless you are in a non English market with other major players). With Google and Yahoo! their own commercial motivations are to show increased volume on core terms to create artificially competitive markets. Google and Yahoo! don't make tons of money when advertisers buy a bucket full of long tail 10 cent clicks instead of bidding up the core heavily searched industry terms. They don't mind if you find some long tail terms, but they want everyone bidding up the core terms. Due to the engines recommending the most obvious terms and some advertisers feeling they NEED to advertise on those terms some keywords get so competitive that the margins are negative. This slim or negative margin environment spurs on rank checkers, click fraud, and other market manipulating activities which drive up the core search volume numbers provided by the major engines on the most common terms. Yahoo! 's keyword research tool (my cooler version tool is available here) will show you the raw number of searches for the prior month. For example, last month they stated that SEO had 51,787 searches on Yahoo!. Since that is a short term in a hyper saturated market you shouldn't be surprised if 90% of that search volume is junky automated traffic or ego searching. I usually rank in the top 10 in Google and Yahoo! for SEO and it typically sends me about 5 visitors a day. While Yahoo! only shows "SEO Book" as getting about 5% of the search volume as the term SEO I get way more traffic for SEO Book. Yahoo! has recently started mailing out keyword promos reminding people to bid up the most competitive holiday related terms. Those are probably good words to steer clear of paying for. Many ignorant bidders jumping into the market at the same time creates an ugly overpriced playing field, although if you can sell them their PPC traffic the overpriced bidding may be a beautiful thing. Keyword terms with a large standard deviation may create good arbitrage opportunities. Google recently started offering 12 months seasonal search data with their keyword tool. Unlike Overture, they only show graphical estimates and trends instead of exact search volume numbers. But I think it is only important to get a glance at trends since exact numbers usually do not matter much (due to automated traffic etc). They also provide quick snapshots of ad market competition and estimated bids. Both of which may be useful in deciding which markets are valuable to enter prior to investing into content creation. In many markets the breadth of the keyword space matters much more than just the volume of the top few keywords. Some markets which are driven around a well known brand with few well known product names may have 90% of the search volume come in under the brand name or a couple slight variations of it. Most markets have much more traffic at the other end of the keyword spectrum though. Keyword phrase modifiers and alternate phrases may be huge. For example, yesterday over 75% of the search queries referring visitors to this site were unique. You can also learn about many of the odd search patterns, consistent seasonal trends, and how search relates to society by reading the Hitwise blog. While they do not have anywhere near the amount of data Google or Yahoo! do, the Hitwise blog is always an interesting read, and does a great job of marketing their services. Mind-share leads to more mind-share. And mind-share leads to expression. If the search volume trends are going up then likely the number of people talking about the topic will go up as well. If you are looking for what is hot right now there are numerous buzz trackers. consider how spread out the search terms likely are in your industry. If you are new to an industry, have limited capital, limited brand equity built up, and your market is hyper-saturated it may be far more profitable to go for niche long tail search phrases, since those will be easier to compete for and they typically have more implied value / targeting / demand. I found your keyword tool very interesting. I normally use the Yahoo tool, and then go to Google and try to estimate based on adwords by putting in a very high bid to see what might come back. How do you get your Google and MSN estimates? I think Aaron says in his keyword video that he uses 50% Google, 25% Yahoo, 12.5% MSN (each having half the traffic of the previous). If you host the tool on your own site you may change the settings. http://searchenginewatch.com/reports/article.php/2156451 shows the Nielson NetRatings for each Search Engine if you want more "exact" data. If you want to get really fancy, you could modify the code to add more search engines, although that isn't really helpful. Exact numbers are only important if you're preparing a report for someone who does not know much about SEO but wants some data to justify a budget to stakeholders. Very interesting stuff. It seems like the analytic possibilities are endless. The real value is in the data. It makes me wonder why we are all giving our search data so freely to Google and Yahoo. Why not develop ways to capture that data as it's sent to them so we can all share in the riches that data mining can bring? Aaron, we've had occasional requests to offer a follow-up reporting service with our keyword reports, where we'd deliver a monthly report with the new counts. The problem is the cost of development and the ongoing cost of using the keyword database APIs. Since you can go get relative numbers from Keyword Discovery (ok, sometimes the data is a little suspect), we haven't seen the demand to justify developing a reporting service. Of course, folks who are running PPC campaigns already get seasonal data if they keep up with it. Any update on this? It seems that for more specific terms / smaller search volumes, the overture tool isn't much use. Google's adwords tool seems very non-specific. I'd like to find an seo tool that gives a good indication of how often a given key phrase was searched for during the last month or few. 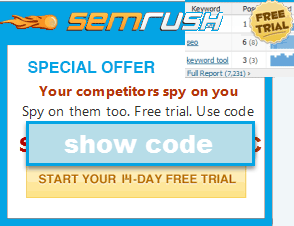 I love your keyword tool, very useful. And all the information here.